Mr. and I took a short anniversary vacation to Orcas Island in September. We’d been there before, but enjoyed re-visiting the art galleries, taking scenic drives and walks. 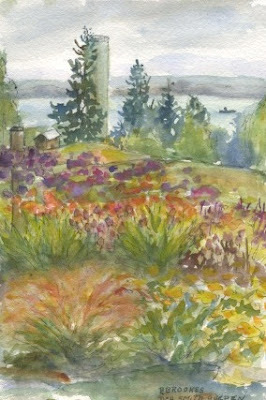 On a lark, we called to arrange a visit to The Lambiel Museum, a private collection of artwork by San Juan Islands’ artists, exhibited in two buildings and throughout the grounds on waterfront property just outside of Eastsound. http://lambielmuseum.org/ Go there. We were stunned by what we found. My favorite was this garden folly. September is often a melancholy month for me. Obviously, the month resurrects those feelings of having to say good-bye to unfettered outdoor adventure and return to the classroom. But it also reminds me that the end of the active gardening season is fast approaching and what did I accomplish anyway? This has been a particularly unproductive year, since my Mr has been out-of-town on business for much of it. It’s not only more work, but lonely to garden by yourself. And our garden clearly shows the result of this. So what was I thinking when I invited guests to our garden? Well, way back this spring when I invited them, I was thinking I might show them around the garden, that they would ooh and aah and then they would settle down to sketch and paint and whatever else they do while I served them lemonade and cookies. For you see – these weren’t your run of the mill guests, but ARTISTS – people who know what things SHOULD look like! Specifically, members of the Whidbey Island Sketchers, http://www.whidbeyislandsketchers.blogspot.com/. One of their members is my friend Pat, http://www.patbrookes.blogspot.com/ , who used to belong to my beloved Twilight plant group. On group outings, you would find most of us debating the species of the plant in front of us or waxing rhapsodic about its bark. Pat would be sketching. Pat also sketched during meetings. How do you sketch, keep track of the conversation and the cheese on your plate? How do you also have a beautiful, Whidbey Island Garden Tour worthy garden, as Pat does? I guess you have to be an artist. I am going to do some weeding this month. But I am also going to lift my eyes from what needs to be done and savor the beauty of September – the lower light that makes everything smokey, the neon orange and pink sunsets, the refreshing coolness of the morning, the fog that softens all the edges.